I had a nice trip up on the mountain today; I was able to see all the mountain harems except for those of Cappuccino and Garcia and all but five of the mountain bachelors. The former Forest Service bachelors are often alone together, away from the other bachelors, though they are sometimes in proximity to them. Today they were away and were in the area that most of the horses were at. This evening, we had a storm system move through the area. The storm clouds came as far south into the Bighorn Basin as the Pryor Mountains, but the system brought high winds to much of the area. 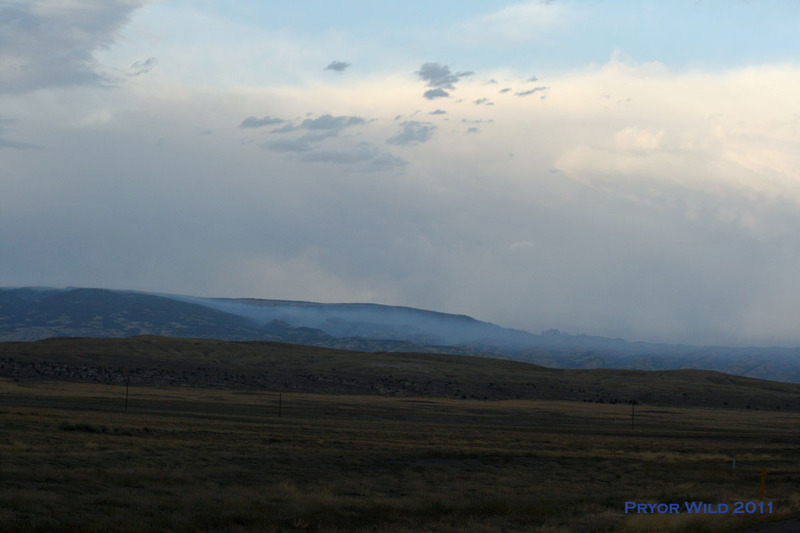 After the dark clouds had moved off of the Pryors, a plume of smoke could be seen on top of East Pryor Mountain. With the winds continuing, it didn’t take long to blow the smoke all over East Pryor. From down here at my house, it looked like the smoke was coming up from somewhere in the vicinity of Dryhead Vista. Now that it is dark, the glow of the fire can be seen in that general area still. What I couldn’t tell, though, is if the fire is on East Pryor itself or if it is in the areas north of the mountain (as was the case with the fire in the Pryors a few years ago). Following are some photographs I took tonight. The first is of the area the smoke was coming up out of while the second shows the smoke covering East Pryor (please click on this one to enlarge it). I will keep my eyes and ears open for any information on this, and I’d appreciate if anyone else could post details they learn here too for everyone else to see. Today I have learned more about the fire thanks to news from the Billings Field Office. It is on East Pryor Mountain in the area of Dryhead Vista, and it is relatively small. Firefighters are there trying to contain it. It sounds like the roads on the National Forest parts of East Pryor are closed due to the fire, so I’ll provide updates on the status of the roads as I learn more. We’ll just have to keep watching to see what the fire does; but based on what I have heard, I am not too worried about it. 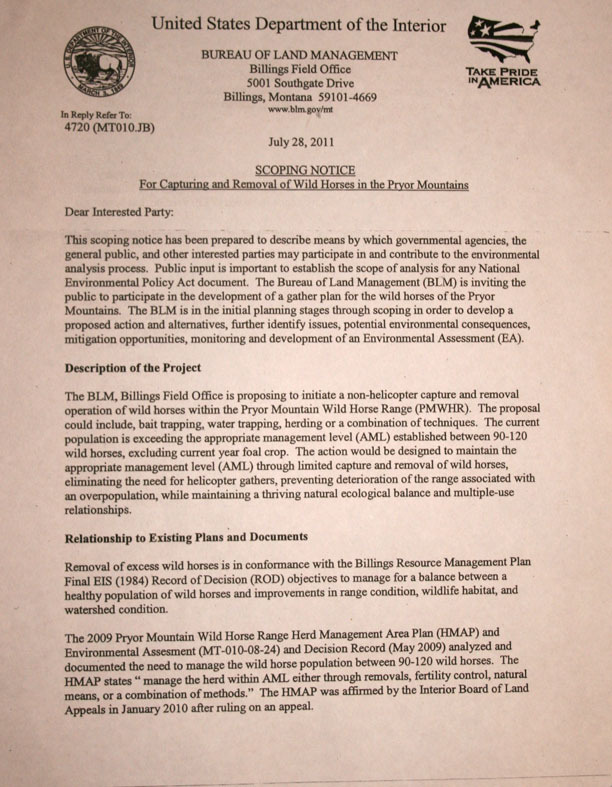 The BLM Billings Field Office has released a scoping notice for a gather on the Pryor Mountain Wild Horse Range. Following is the press release on the scoping notice as well as a copy of the scoping notice letter. 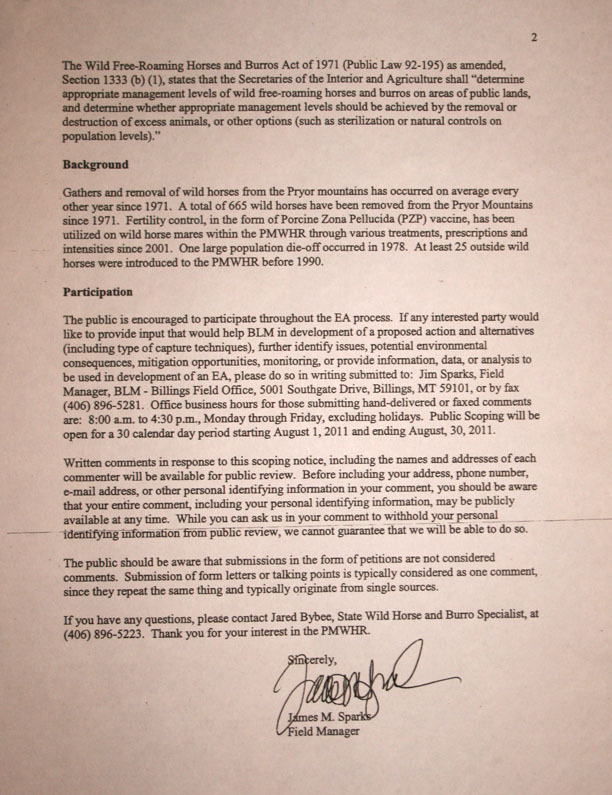 The Bureau of Land Management (BLM) Billings Field Office seeks public input on a proposed 2012 wild horse gather within the Pryor Mountain Wild Horse Range (PMWHR) during a 30-day scoping period, Aug. 1-30, 2011. The public scoping process is the initial stage in developing an Environmental Assessment (EA) that analyzes the effects of the proposed non-helicopter gather and removal of excess horses within the PMWHR. Gathering methods could include bait trapping, water trapping, herding or a combination of these techniques. Since bait trapping can occur year-round, the gather is scheduled to take place at any point during the 2012 calendar year. With a variety of competing uses on the land, the gather is designed to manage the appropriate number of wild horses so that rangelands and horses can be healthy and productive for years to come. The current wild horse population is approximately 150 horses with 17 foals, exceeding the established Appropriate Management Level (AML) of 90-120 horses, excluding the current year foals. If anyone would like to provide input that would help the BLM in the development of a proposed action and alternatives (including type of capture techniques); further identify issues relating to potential environmental consequences, mitigation opportunities, and monitoring; or provide information, data, or analysis to be used in development of an EA, please do so in writing submitted to: Jim Sparks, Field Manager, BLM Billings Field Office, 5001 Southgate Drive, Billings, MT 59101, or by fax at (406) 896-5281.